Do you have an interest in becoming a mechanic? Do you want to learn how to do basic repairs and other jobs you’d commonly take your car to the shop for? Or do you just find the automotive industry interesting? If so, then you should check out the Autos classes, taught by John Hladovcak. The classes take up a two-period block, so keep that in mind when filling out your schedule. The classes are also very hands on and require students to work together. Be prepared to get a little dirty from oil and other debris. Autos I teaches students shop orientation and how to use basic tools. The core content focuses on tire repair, different mechanisms of the car and how to repair them, and students will have an opportunity to learn about disassembling and reassembling an engine. Autos I has no prerequisite and can be taken as early as freshman year. Autos II focuses on more advanced repair techniques. It also goes further in depth on braking systems. Year two students will focus more on how to diagnose and fix more complex problems with engines. The class will also cover the airbag system and passenger restraints along with other electrical components. The only prerequisite for this class is to pass Autos I. “I really enjoy how hands on the class is. I like how Mr. H is very quick and to the point. He likes to demonstrate what he’s talking about and then has us practice it,” senior Brenden Gibson said. “The most interesting thing we’ve learned, so far, is how to properly wire new car stereos. I would definitely recommend it to other students even slightly interested in taking it,” Gibson said. “ This is my ninth year here. I emphasize problem solving in my class. Teaching auto with today’s cars is challenging– the way technology changes from year to year and with all the different models, it is impossible to know every problem with every system that we see. So to compensate for this we must research every problem, use specialized test equipment and follow manufacturer’s flow charts,” autos teacher John Hladovcak said. “I wish my shop was bigger. 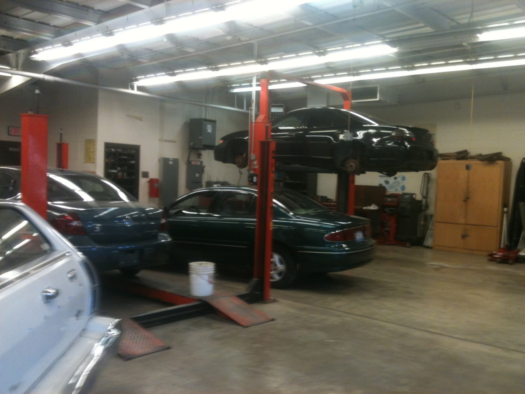 Although I love my facility here at OTHS, I often wished I could expand my building to take on several long term projects.” “I know not every student that is under my tutelage will go on the become technicians, but to see students understanding of automotive systems increase so they can maintain their own car for the rest of their driving days is awesome,” Hladovcak said. If you had any thought of taking autos and kept putting it off, hopefully this article inspires you to take it and learn valuable lessons that you’ll use throughout your life.